Explanation: After an interplanetary journey lasting 200 days, the Mars Odyssey spacecraft has entered orbit around the Red Planet. This latest success is welcome as in the past, Mars has often seemed a difficult planet to visit. Beginning with the first Soviet attempts in 1960, around 30 missions have tried while only 10 or so have gone without serious mishap. Now that Mars Odyssey has arrived, its immediate future will involve aerobraking. Cautiously dipping into the martian atmosphere, the spacecraft will gradually adjust its present wide and elliptical 20-hour orbit to a circular 2-hour orbit only 400 kilometers above the planet's surface. Then, its instruments and cameras will focus on exploring the climate and geologic history of Mars, including the search for water and evidence of life-sustaining environments. 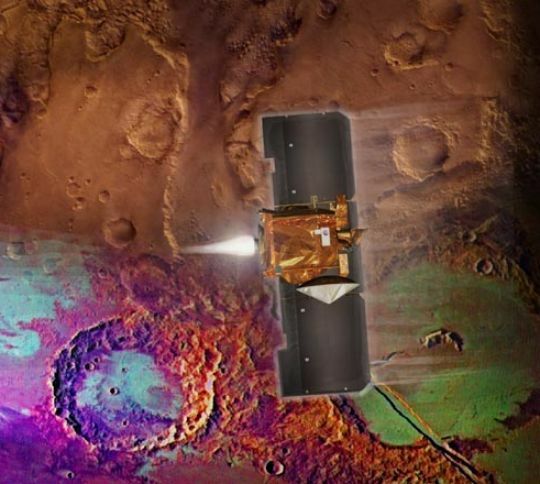 In the artist's conception above, the spacecraft with wing-like solar panels is imagined firing its rocket engine for Mars orbit insertion over terrain seen in natural and false-color.